Prevent squirrels, woodpeckers, or other animals from altering your existing wooden bird house entry with this Erva Steel Hole Protector. Adding a guard around the entrance hole of your existing bird house creates a durable barrier, keeping the home suitable for bluebirds. This lasting, galvanized steel square has a 1.5" diameter hole in its center, perfect for use with bluebird houses, and the tan, powder coated finish blends with wood easily. Predrilled holes in each corner of this square, along with four included screws, make it simple to attach this guard to your bird house. The steel construction remains strong and resistant to animal damage for many seasons, and the power coated, tan hue enhances your bird house. 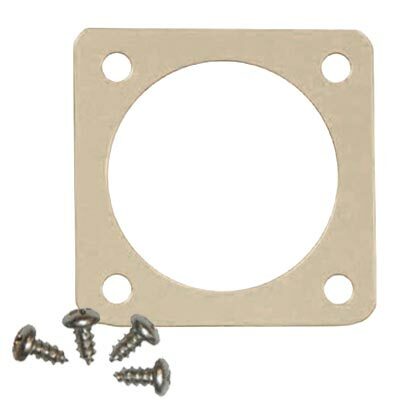 Keep your bird house opening from being enlarged by surrounding it with this Steel Hole Protector. Made in the USA.